If you are a pet owner, it is a good idea to write a letter to pet guardian to keep with your estate planning documents. After you execute a pet trust or other legally enforceable estate planning documents to provide for your pets, it is important to leave the pet guardian detailed instructions for the care of your pets in the event of your incapacity or death. Whether your estate plan designates a friend, relative or pet retirement home as the guardian of your pets, the guardian will need detailed information about each pet and its history for a variety of reasons. Your pets will have a better chance of surviving and receiving the type of care you want if you leave a detailed instruction letter to their pet guardian. If your pet guardian has accurate information about any behavior issues of your pets, it is less likely they will end up in an animal shelter if something happens to you. A detailed health history, including vaccination records, may prevent your pets from receiving vaccines they already had or missing important medications. Leaving a letter to pet guardian can ensure your pet will not be put through painful chemotherapy treatments or surgeries you may not want them to endure. Finally, a letter to pet guardian is a good way to leave detailed instructions about how you want your pet guardian to handle the disposition of remains of your pets, such as cremation or burial. Note: A letter to pet guardian is an estate plan letter that should be created in addition to a pet trust or other formal estate planning provisions for the care of pets that survive you. A letter to pet guardian is not a substitute for formal estate planning for pet owners. See our free Pet Owners Estate Planning Guide for more information. To download and print a free letter to pet guardian form you can complete in as little as fifteen minutes, see free estate plan forms. Your letter to pet guardian should be kept in a place that would be immediately accessible in your absence. While estate plan letters should generally be kept with your will, living trust, pet trust or other estate planning documents, a letter to pet guardian should not be kept in a safe deposit box or a locked safe that would not be accessible immediately in an emergency. However, you can put a duplicate copy of your letter to pet guardian in a safe deposit box or locked safe. It is a good idea to discuss this issue with your pet guardian in advance so they know where to find critical paperwork about the care of your pets. In addition, make sure your letter to pet guardian is labeled properly so it is clear to the executor of your estate, trustee of your trust or agent named under a financial power of attorney, that this letter should be given to your designated pet guardian. See estate plan coversheet. Your letter to pet guardian should include all information you believe is relevant to the proper care of your pets. When you write your letter to pet guardian, think about the information another person would need if they were suddenly entrusted with the care of your pets and had never met you or your pets. Try to be as detailed as possible with your instructions without being repetitive. 1. 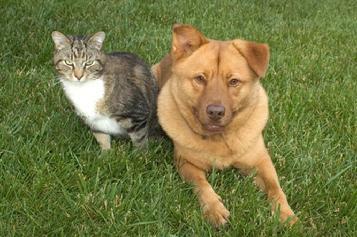 Physical description of each pet including breed, color, markings, and weight. Attach a photo of each pet with their name if possible. 2. Instructions on where to locate veterinary records for each pet, including rabies vaccine records, county licenses, other vaccine records, and health history paperwork. 3. Contact information for the veterinarian and groomer your pets visit. 4. Contact information for the boarding kennel or pet sitter that provides boarding or pet sitting for your pets. 5. A list of food allergies, medications, brand of food, and daily food quantity for each pet as well as any diseases or injuries of each pet. 6. A summary of behavior issues for each pet including whether your pet interacts well with children and other animals, whether each pet is housetrained, fears and phobias such as storms, whether the pet is a flight risk, ability to crate the animal, biting history, etc. 7. A statement regarding what type of medical treatment you want your pets to receive. For example, if you want your pets to receive the most advanced medical treatment, irrespective of the cost, include this information. If you do not want your pets subjected to painful medical treatments such as chemotherapy, certain types of surgeries, or other painful procedures, include statements about what types of medical treatment you want your pets to receive and the circumstances in which you believe euthanasia is a better alternative for your pets. 8. Memorial preferences or last wishes for your pet. If you want your pets cremated, include that information as well as what you want done with their ashes. If you want your pets buried in a pet cemetery, include contact information for the cemetery. All estate planning documents should be reviewed and updated on a regular basis. As any pet owner knows, pets experience frequent changes in health. Review your letter to pet guardian at least once a year. If any changes are needed to make the letter current, prepare a new letter to guardian and destroy the old one. See pet guardian form.